As an 80s child there are food quintessential to my childhood regardless of how good it tastes. Findus Crispy Pancakes, McCain Micro Chips and tinned Campbells Meatballs (in onion gravy of course) is what I was raised on. Interspersed by the frequent appearance of Mince & Totties and Lentil Soup. After all it was the 80s. Convenience food was de rigueur and my Mother was in awe of the power of the microwave. These foods hold a certain nostalgic charm to me, and I wasn’t what you would class a ‘fussy eater’ but lets face it, they are hardly going to excite the palate of any child. That said, I understand the appeal in convenience food particularly when feeding young children. I make no attempts to restore the nation, in a culinary sense, to a time where we were tied to the cooker for lack of options but I do encourage anyone willing to have a go at recreating convenience food. That said, this effort is only worth our while if the home-made version takes less time to cook and tastes better than the convenience version, right? After all this is all I am concerned about when it comes to cooking and eating. I didn’t grow up eating Fish Fingers, in fact I hated them. They were always soggy and had a funny smell. Looking at them now I’m also a little spooked by the florescent orange crumb coating. Enter the homespun version and I’m utterly hooked. These retain that level of crunch the processed can never achieve. 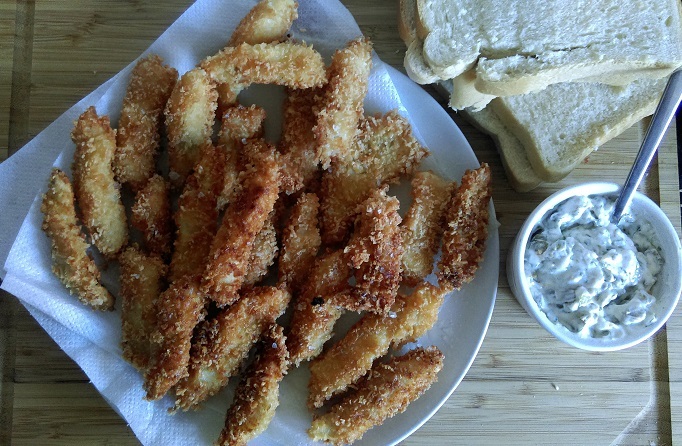 The simplicity of the fish fingers sannie is precisely where its appeal lies. I reckon once you’ve made a couple times and gotten used to the process, you could churn these out faster than it takes to cook the frozen variety in the oven. The difference is, this way you know EXACTLY what is in your food and you wont believe the difference in taste. You can make these with any sustainable white fish but if you’re unsure, ask your fishmonger (or the fishmonger in the supermarket) for tips. My usual suspects include: whiting, coley and more recently Vietnamese River Cobbler. You can also use cod and haddock of course. Start with the tartar sauce. Roughly chop the capers and cornichons and toss them into a bowl with the mayonaise and parsley. Add the lemon juice, salt and pepper to taste and mix until combined. Chill in the fridge until ready to use. Next, heat the oil in a deep frying pan, wok or deep fat fryer over a medium/high heat. If you are using a thermometer it should reach 160-170C before you can cook the fish. Alternatively, give the oil 5-10mins to heat up then toss a small piece of bread into the oil. If the bread turns brown & crispy within 60secs the oil is ready for cooking. While the oil is heating, set out 3 shallow bowls on your kitchen counter. Add the flour to 1 bowl, add the beaten egg to the 2nd bowl and add the Panko breadcrumbs to the 3rd bowl. Slice the fillets of fish in half down the middle. Then slice each half, on the diagonal, into long thin strips. It’s easier to prepare the fish all at once then lay it out on a chopping board ready to cook. When the fish is coated, carefully lower several fish fingers into the oil & cook until golden brown. You need to turn once to ensure they are evenly coloured but they will only take 60-70secs to cook. I cook mine in batches of 4-6 (depending on size). Cooking too many at once will cause the oil temperature to drop which will results in greasy fish fingers. 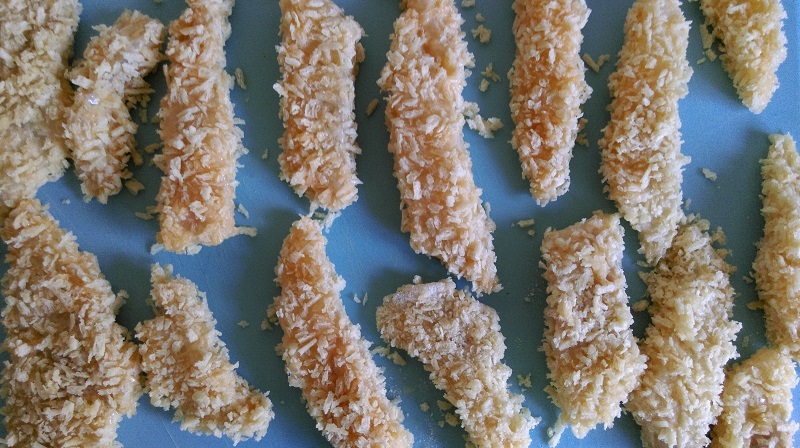 Rest the fish fingers on kitchen paper when cooked then when they are all cooked, sprinkle with sea salt. 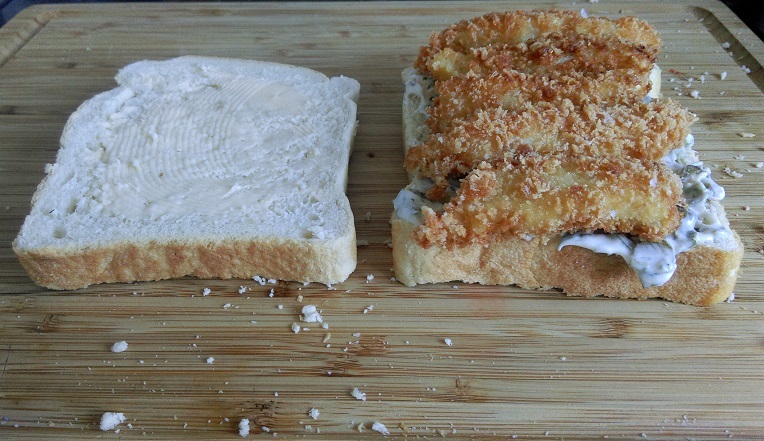 Slather both pieces of white bread in butter then spread one piece of bread with the tartar sauce. Or you can indulge the child inside and opt for a dollop of Ketchup. A comforting nostalgic teatime special to wrap your teeth around. Eat Them Later: If you leave the fish fingers to cool then store an airtight container in the fridge, they will keep for 1-2days. You can reheat by laying the fish fingers on a baking sheet & cooking in the oven at 180C for 25mins. Serve immediately. Make It Vegan: Replace the egg with tempura batter and coat the bread in Vegan margarine (Vitalite) instead of butter. If you can find it, use Vegan-Friendly mayonnaise in the tartare sauce. Make It Gluten Free: Use rice flour or cornflour to coat the fish. If you cant find GF breadcrumbs, make your own by blitzing a few slices of GF bread in the food processor. Of course, replace the white bread with GF bread. 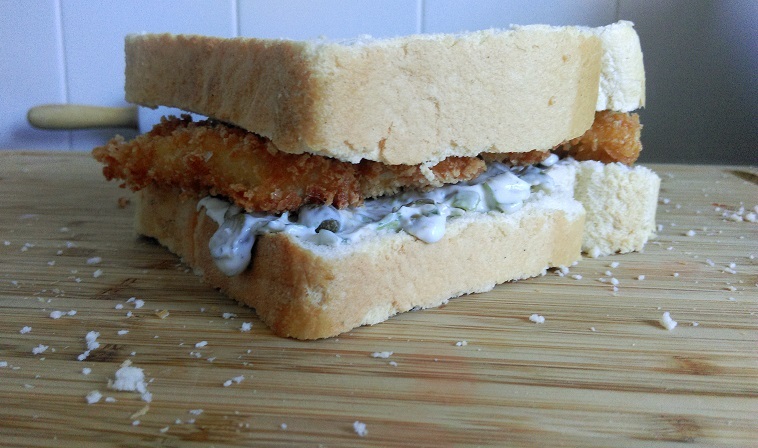 I have never had a fish finger sandwich! I have a 5yr old daughter and like to feed her good stuff (she’s never had a crispy pancake!). I think I need to try this for both of us!